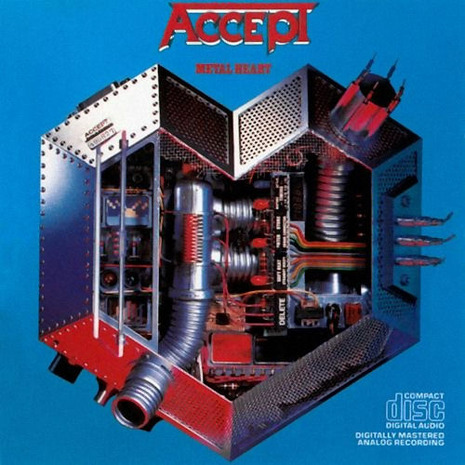 Metal Heart is a 1985 release by German heavy metal band Accept. Although the group had recorded before at Dierks-Studios, this was the first album produced by Dieter Dierks himself. This album was a cautious attempt to crack the lucrative American market with more accessible songcraft and emphasis on hooks and melodies. Although critically panned at the time, today Metal Heart is often considered by fans as one of the band's best records. It contains several of their classic songs such as "Metal Heart" and "Living for Tonite". The band also makes a detour into jazz territory with the unusual song "Teach Us to Survive". Wolf Hoffmann explained the concept behind the album: "We had read an article that someone was working on an artificial heart and that one day everybody is going to have a computerized heart. It talked, in general terms, about how more and more of humanity gets sucked out of the daily life and more and more replaced by machine. It's not a new thing now, but then it was new. Humans versus machine, was the general vibe of the record." The original cover concept was for a hologram metal heart image, until budget considerations resulted in a traditional cover. But fittingly for the futuristic theme of the album, Metal Heart was the first Accept album to be digitally recorded. Wolf recalls Dieter Dierks as a very demanding producer: "We would do some pieces several dozen times trying to capture what he had in his mind for a specific section," adding: "Each song we tried different combinations of guitars, mic'ing and even strings!" The song "Metal Heart" is well known for containing the cover of two famous classical themes: Tchaikovsky's Slavonic March (in the intro) and Beethoven's Für Elise in the main riff and solo. This song was covered in 1998 by Norwegian Black Metal band Dimmu Borgir. "I had no idea it would become as popular as it did," Wolf remembers of his contribution to the song. "Midnight Mover", about a drug dealer, is one of the more commercial songs on the album and was selected for a memorable music video that anticipates the bullet time filming technique by a full decade. "Just ahead of our time again!" jests Wolf. Despite the more commercially appealing sound of the album, it fell short of the sales figures of its predecessor Balls to the Wall in America. Udo remembers the Breaker through Metal Heart era as the time when the band got along best together. Thus this would turn out to be the last album of Accept's golden era, as cracks were soon to appear in the band's solidarity. The digitally remastered CD edition includes two live bonus tracks "Love Child" and "Living for Tonite", both taken from the album Kaizoku-Ban.